They are all based on the same underlying principles, and together, provide a comprehensive, cohesive suite of tools. Tripod Beta has been validated in a wide range of industries and has been in use for more than 25 years. Shell’s life saving rules, which were derived from the analysis of many Tripod Beta investigations, have been adopted by many organisations. 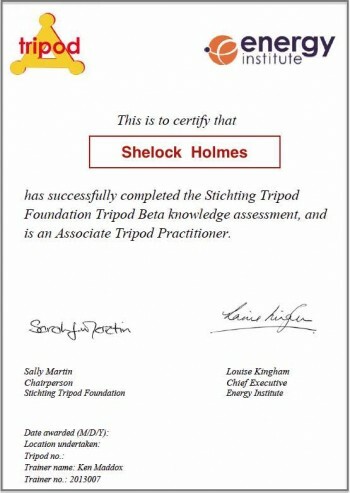 In 1998, Shell transferred the copyright of the Tripod Beta methodology to the Stichting Tripod Foundation (STF), a charitable body governed by Dutch law. The Foundation's purpose is to promote best practice in the understanding and prevention of incidents through the use of Tripod Beta. In 2012 the Foundation partnered with the Energy Institute in the UK to help achieve this. Many companies in many industries are now following Shell’s lead and using Tripod Beta to learn from incidents. Oh – and about the name Tripod Beta - one of the early accident causation diagrams had three corners, which led to the name Tripod – named by Jop Groeneweg after a Gabonese three-legged dog that he saw on a field trip. Corporate objectives are achieved by controlling the business. Theses objectives might be related to: production, quality, return on investment, impact on the environment, safety, health etc. One aspect of achieving these objectives will be to avoid unwanted events. Unwanted events are avoided by controlling the hazards that cause the harm and/or defending the things that could be harmed. If an unwanted event does occur then it is logical to assume that there is something wrong with the controls. These controls are identified, implemented and maintained by the Company's mangement systems. Tripod Beta is designed to reveal the controls that are: missing, inadequate or failed. Tripod Beta also provides a control framework for managing the investigation so that the work will be: efficient, systematic, thorough, repeatable (i.e. two teams investigating the same incident will arrive at the same findings). Fig 1. Tripod Beta - end event. It is usual to start with the end event and work back. The end event is the reason for the investigation. Show time running from left to right. Show the events that led directly to the incident. Fig 3. Tripod Beta - trios. Split each event into what was harmed and what did the harming. This diagram is similar to a horizontal cause v effect diagram. Not all the events from figure 2 have been shown. Event "ladder tilts and throws painter off balance" has been split into two events "ladder tilts ...." and "painter falls ....."
Splitting events promotes a better understanding of the incident. Work with detailed trees in the early stage of the investigation. Trees can be expanded and collapsed to aid the investigation team and report reader. Fig 4. Tripod Beta - barrier analysis. Each leg in the diagram is examined to see if there is a way in which this "path" could be blocked - i.e. with a barrier. The barriers chosen should comply with "good practice". Had anyone of the barriers been effective the end result would not have happened. Fig 5. Tripod Beta – the immediate cause. Examine each barrier in turn to determine how it was defeated. Failed barriers are always defeated by a substandard act, never by an unsafe condition. Categorise the substandard act to narrow the search for preconditions (performance influencing factors). In the example given the substandard act is 'painter stepped off ladder to one side and from second rung. The ladder use guideline says 'step straight back from bottom rung'. To properly understand why the painter did what he did it is important to consider the possibilities e.g. 1) he knew about the ladder use guideline but, in the heat of the moment, he forgot (lapse), or 2) he did not know about the ladder use guideline (knowledge based mistake), 3) he knew about the ladder use guideline, remembered what to do but chose not to do it (violation). Investigation can go wrong at this point e.g. sending the painter on a ladder use course if it's a violation, or cautioning him if it was a genuine lapse of memory. Preconditions - also known as "performance influencing factors" (PIFs) are the workplace conditions that led to the sub standard act. It is important to know the perpetrator of the substandard act to positively associate the preconditions with the imediate causes. In this particular instance the painter was under pressure to compete the job before the rains came and furthermore he had never been told about the ladder use guidelines. Note the line between the preconditions (blue box) and the immediate cause (grey box) is dotted. This is to show that it is not a direct cause v effect relationship i.e. the painter will not always perform a substandard act if these two PIFs are present. It is a Bayesian relationship i.e. the preconditions increase the likelihood of the substandard act. Operational controls (systems) enable the workforce to produce goods or services; they also enable the workforce to install and maintain barriers preventing unwanted events. Examples of operational controls are: permit to work procedures, management of change procedures, plant operating instructions, provision and use of workplace equipment policy etc. Operational controls spell out what needs to be done and how to do it. In this example we are saying that: 1) the task was not planned correctly i.e. whoever did the planning did not take into account the weather forecast, and 2) the ladder use guideline is failing in that the painter did not know about it. In this case the investigation team found that management controls are flawed in that: 1) supervisors choose to ignore the task planning process. The problem here is that the custodian or owner of the task planning system is not seeking confirmation that it is being followed and not promoting adherence to the system. And 2) the ladder use guideline is adequately defined but no one is seeking assurance that it is followed or promoting it's use. In the above example Tripod Beta would prompt the investigation team to seek out more preconditions i.e. is substandard performance rewarding in some way e.g. a bonus payment to finish on time, or is the desired performance punishing e.g. the supervisor complains if the job is not completed on time. And, in the second precondition, was the job given to the right person. Underlying causes should identify the system flawed AND the way in which it is flawed. In the example the systems are: 1) task planning and 2) Ladder use guidelines. In both cases in the example the system documente clearly state what needs to be done in the workplace. But, do the documents clearly state how the system will be managed e.g. who will disseminate the requirements, who should audit the process, etc. Actions should be taken about the failed barriers before operations are resumed - one accident is more than enough. The aim is to maintain risks to "as low as reasonbly possible" so, in the short term, expensive temporary barriers may need to be implemented. Actions should also be taken to remove the negative influences in the workplace i.e. preconditions. However, unless the fundamental underlying causes are corrected, any actions taken to improve the preconditions will be short lived. Forget about taking actions at the immediate cause - they all sound like exhortations e.g. try harder, pay more attention, be more careful. There are two more things to be done: 1) deciding what to do about the flawed systems, and 2) doing it. WHAT happened i.e. what was the sequence of events leading directly to the accident? HOW did it happen i.e. 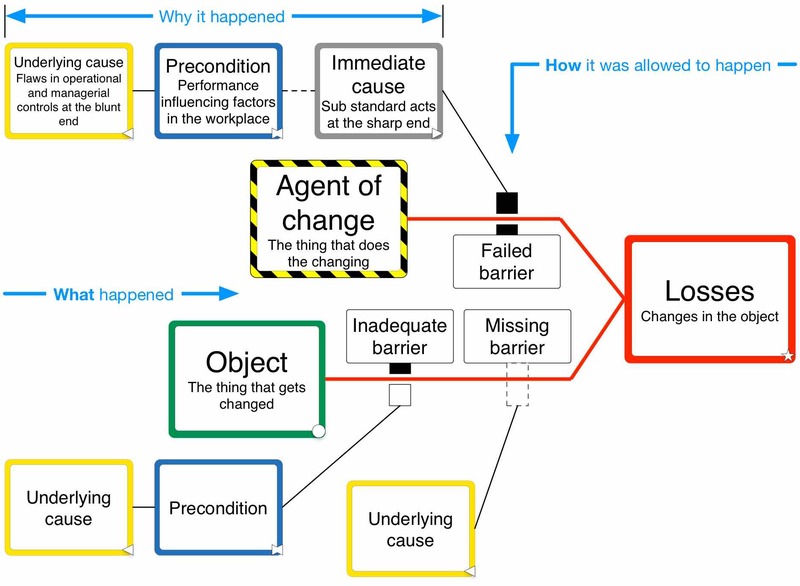 what barriers should have prevented the incident but were either missing or failed? WHY did it happen i.e. why did the barriers fail? Tripod Beta, with it's clear cause v effect reasoning and graphical representation, will help in: 1) engaging with stakeholders in deciding what needs to be done, and 2) winning hearts and minds to do it. Tripod Beta is a rigorous, systematic, and thorough process. There are rules to be learnt so training will be required however, on the positive side, 1) the process can be audited, 2) a shallow investigation is easily spotted, and 3) two different investigators are likely to arrive at the same findings. The visual representation of the analysis i.e. the Tripod Beta Tree, helps investigators to piece together the evidence in a way that: 1) aids understanding, 2) promotes insights, and 3) suggest lines for further enquiry. The graphical representation of the entire incident aids communication and improves understanding within the investigation team and with the report reader. Investigator 3 produces concise and consistent incident reports. Leads to improvements that are far reaching, and long lasting. Produces reports that are robust to challenges since the process is scientifically founded and operationally proven. Concepts and terminology – are consistent with those used in proactive risk management hence the time it takes to become proficient in Tripod Beta is reduced. It also enables the findings from Tripod Beta to be easily linked to your risk management processes. Human behaviour – Human errors of some kind cause the vast majority of incidents. Tripod Beta identifies these errors but these are seen as the start of finding the cause of the incident and not the end. Line of Enquiry – Tripod Beta’s, help features, and checklists focuses the investigator’s line of enquiry so that an investigation requires less time and is more thorough. Also, managers are more confident that remedial actions will be effective. Reports – These are easy to read and understand and are compiled automatically by the Tripod Beta software. These reports include the graphical representation of the incident, (Tripod Beta Tree). Managers, who may have to read several reports a month, find the consistent format and layout a big help. 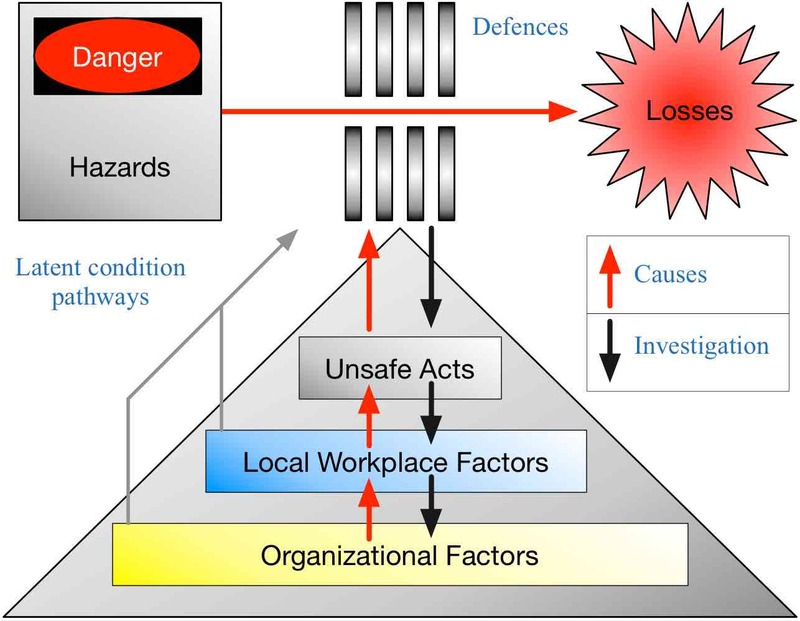 Management Systems - Categorisation of Underlying Causes of incidents by elements of the management system, e.g. ISO 9001, ISO 14001, OHSAS 18001, aids identification of shortcomings in these systems and also those responsible for their remedial action. 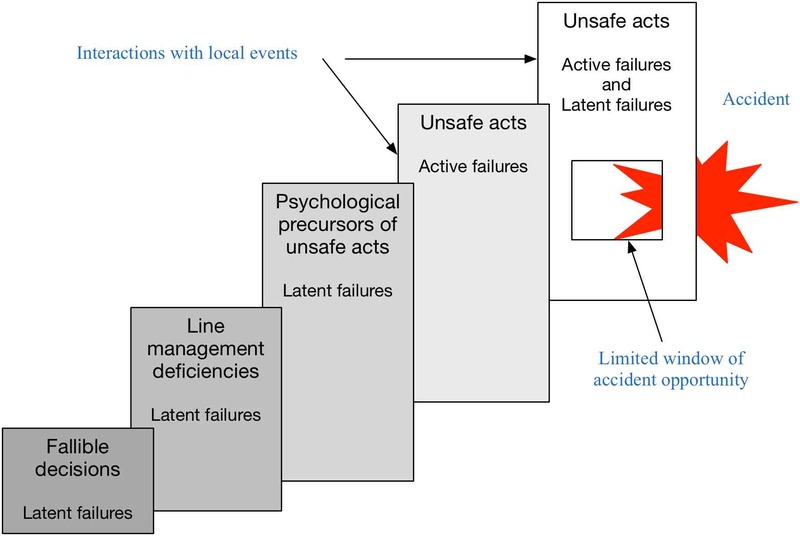 Categorising underlying causes enables findings from many incidents to be combined so that remedial actions can be based on several incidents instead of one. Other nodes in the Tripod Beta tree can also be categorised enabling analysis of many incidents, e.g. trend analysis, comparative studies, evaluating past improvement initiatives thereby providing further learning and remedial actions. Categorising nodes allows incident reports to be compared with other reports, e.g. audits, management reviews, inspections, unsafe act auditing etc. This enables cross validation of business processes and the consolidation of findings from many sources into a cohesive, overall improvement plan. Minor & Major Incidents – The Tripod Beta concepts and principles are appropriate for both minor and major incidents so only one incident investigation process is required. 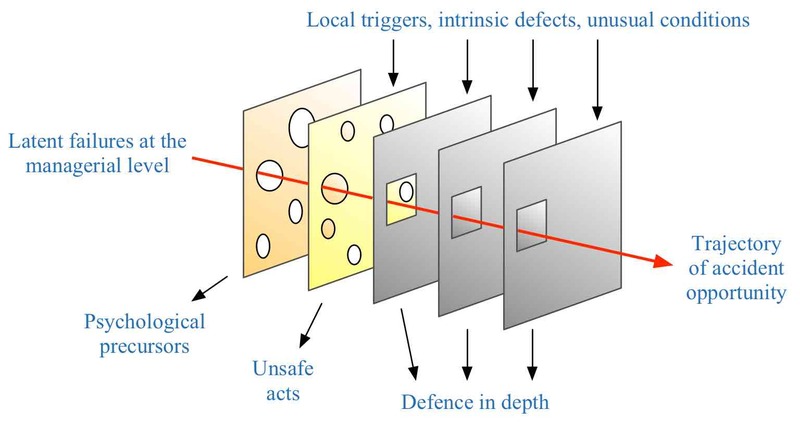 James Reason, in his book The Human Contribution, says, “I didn’t invent the label Swiss Cheese Model though I am eternally grateful to the person or people who did. I have two suspects for the role of inventor: Dr Rob Lee, then director of the bureau of Air Safety Investigation in Canberra, and Captain Dan Maurino, the human factors specialist at ICAO in Montreal. The model evolved and it was only the later versions that took on the Swiss cheese appearance. This last version is shown on the front cover of “Managing the Risks of Organizational Accidents” and is the version that most accurately represents the Tripod Beta methodology. Figure 4 has evolved into a practical, root cause analyis tool. This format enables a sequence of events to be shown as a string of trios. The OBJECT is shown as a separate entity rather than assumed within the description of the losses. This also enables a distinction to be made between barriers that control the AGENT OF CHANGE and barriers that defend the OBJECT. The chain represents the barrier. The barrier description explains what the chain does. 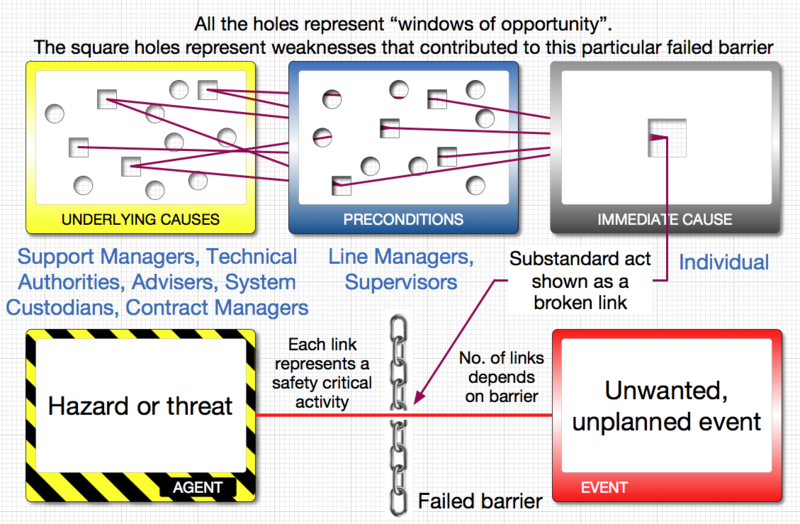 Each link in the chain is a safety critical activity that contributes to establishing and maintaining the barrier. The number of links in the chain depends on the complexity of the barrier. Links can represent something technical e.g. an alarm signal. Links can also be behavioural e.g. operator stops pump on hearing alarm. If one safety critical activity is sub standard then that particular link fails and the chain parts allowing the hazard trajectory to pass. The immediate cause describes how a particular link in the chain failed. The UC that contributed to the incident under investigation are shown as square “windows of opportunity”. The Stichting Tripod Foundation (STF) is a non profit making organisation registered in the Netherlands as a charity. The STF was set-up by Shell International in 1998, to act as custodians of the Tripod methodology. liaise with other organisations worldwide with similar objectives. In 2012, the Stichting Tripod Foundation partnered with the Energy Institute (EI) to help meet its objectives further. The Stichting Tripod Foundation (STF) controls the quality of all aspects of Tripod. 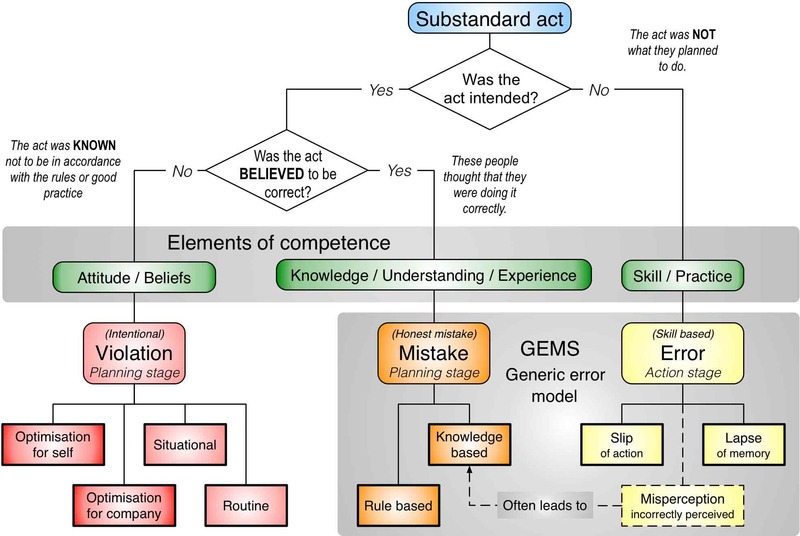 This diagram gives some indication of the incremental increase in knowledge and skill between each level. Progressing from associate practitioner to practitioner does not involve acquiring a lot of new knowledge but it does need a big increase in skill i.e. practice and experience. Tripod Beta is deceptive in that it appears to be a very simple process however; it takes a lot of practice to produce good reports. All practitioner and trainer certification is done through the Energy Institute. Primarily those involved in accident investigation and analysis should become Accredited Tripod Practitioners. Your reports will be regarded as being more creditable if the person who has written them has been assessed by a respected, independent organisation. And it provides a degree of assurance that the investigation and analysis has been done properly. achieve a pass grade with two of your own Tripod Beta incident investigation reports. Immediately after the course your trainer will send your marked exam paper to the Energy institute who, in turn send an Associate Practitioner’s Certificates to successful candidates. They will also explain the next step regarding submitting two accident investigation reports. The whole process, from taking the exam to achieving practitioner accreditation, can take several months. There is a fee, payable to the Energy Institute, to cover administration and the cost of having your two reports evaluated by an accredited assessor. If a report does not meet the required standard, the assessor will provide an explanation on how the report needs to be improved. The candidate can resubmit a revised report. This is the case study from EI/STF's Tripod Beta - guidance on using Tripod Beta in the investigation and analysis of incidents, accident and business losses. This is quite a complicated incident and is probably not a good example for those new to the Tripod Beta format. This accident has been taken from HSG245 (Investigating accidents and incidents). In the HSE's book the accident has been analysed using "why because" methodology. Go to http://www.learnfromaccidents.com/free-information to download a copy of HSG245. The example available here uses Tripod Beta - you may wish to compare the two. This accident has been taken from the Rail Accident Investigation Branch19/2011 report. No new analysis has been done in this Tripod Beta version available here. It has only been provided to show an alternative way of displaying the findings. This accident analysis is the basis for a training video.